A 10-member delegation from Vail is in Japan this week at the invitation of officials from Yamonouchi-machi, located in the Nagano Prefecture. Global Friendship Exchange programming discussions with the Japanese representatives have been under way since last July, when the Vail Town Council hosted an exploratory visit attended by Yamanouchi’s mayor and other Japan dignitaries. The 12-member visiting delegation participated in a formal meeting with the Vail Town Council on July 17 which included information exchanges on environmental sustainability, culture and tourism. The official discussions are continuing Jan. 20-26 during a reciprocal trip in which representatives from Vail are in Yamonouchi-machi to participate in additional information exchanges. “On Wednesday, Jan. 25, the Vail delegation yesterday visited the famed Jigokudani Snow Monkey Park in Yamanouchi, Nagano prefecture, Japan. The park is located in the Joshinetsu Kogen national park and is a treasured natural wildlife refuge appreciated by Japanese citizens and visitors from all over the world. “While returning from the park through a scenic walking path, the delegation was interviewed by a team from TV Asahi network for a nationwide variety show in Japan. The day’s activities concluded with a welcome reception and traditional dinner with the Yamanouchi delegation. 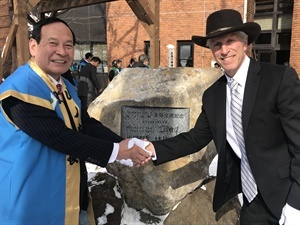 “Activities on Thursday, Jan. 26 included formal meetings with the Yamanouchi-machi Mayor Yoshitaka Takefushi and the town delegation, culminating with the formal unveiling of a stone memorializing the Vail-Yamanouchi Global Friendship Exchange. “The Vail delegation continued onward to Nagano where formal meetings with governor Abe and the Nagano Prefecture delegation took place. At both formal gatherings, the dialogue centered on our unique mountain resort environments, economic growth, transportation and sustainability in our respective treasured hometowns.